Note - Rue has some toxicity reports. 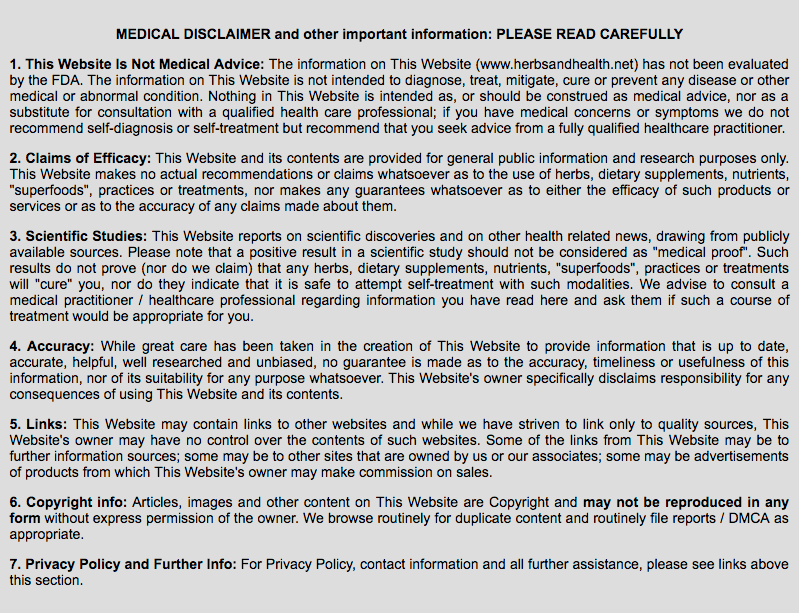 See scientific studies (below) for details. Latin - Ruta graveolens - also Ruta, Ruta hortensis, Ruta hortensis major, Ruta graveolus, Ruta hortensis, latifolia. B. P. 336. 'T. 257. 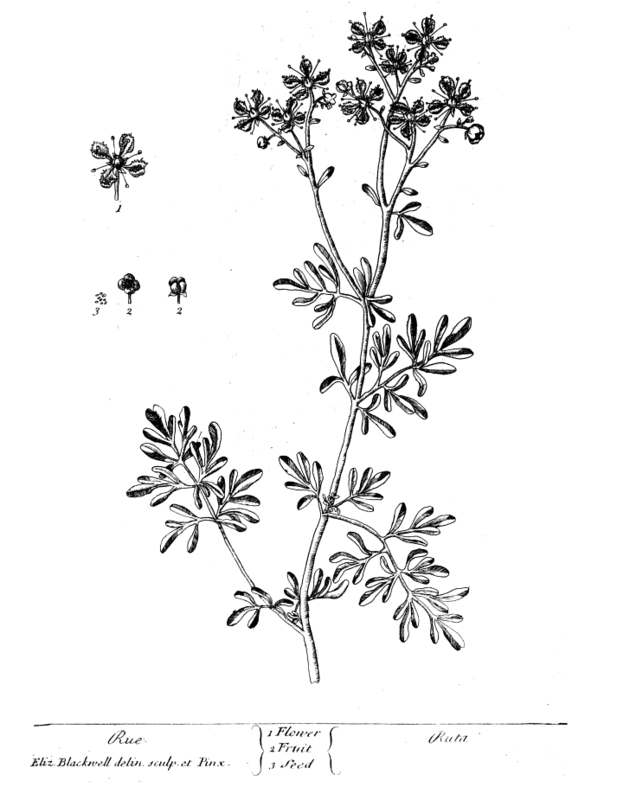 Ruta graveolens, hortensis. Dod. 119. Ruta sativa, vel hortensis. J. B. iij. 197. R. H. 874. Ruta hortensis. Ger. 1255. Ruta hortensis major. Park. 132. Ruta hortensis major, latifolia. H.Ox. it. 507. Ruta, foliis decompositis. H. Cliff. 145. Contact with rue has been found to cause skin rashes, excema and dermatitis when combined with direct sunlight. The condition produced by these factors is called Phytophototoxicity, a type of photocontact dermatitis. According to a 2007 study, Phytophototoxicity is different from the type photocontact dermatitis caused by allergic reaction (allergic photocontact dermatitis occurs only in individuals with a known allergy to Rue). Although the factors that result in phytophototoxicity are more complex than that of allergic photocontact dermatitis, cases of phytophototoxicity are reported more frequently. Rue (Ruta graeolens) has recently (2011) been studied for its potential to inhibit the production and survival or cancer cells. To test its anticancer properties, extract of Rue was tested on colon, breast and prostate cancer cells. Researchers determined that extract of Rue contains bioactive compounds which can potentially inhibit cancer cell production and survival. Rue was commonly used as a "cure" during the plague. In Aristotle's day, common (cultivated) Rue was worn around the neck to protect one from evil spirts and witches' curses. Its alternative name, Herb-of-Grace, was coined by early Christians in the Middle Ages who used it to perform exorcisms. During the Middle Ages, Rue was administered by midwives as a contraceptive and to induce abortion. Italian Renaissance painters consumed leaves of Rue to prevent eye-strain. In The Healing Art: Or, Chapters Upon Medicine, Diseases, Remedies and Physicians (1887), William Henry Davenport Adams explains how the business of healing in England in his day was dominated by "wise woman" who, --with a suspiscion of witchcraft, or, at least, of uncanniness, clinging to her--who concocted all kinds of potions and infusions which then formed the people's pharacop≈"a. Davenport Adams clearly defines the methods of the "wise woman" as separate from "the Healing Art," asserting that the plants "relied upon [by] herbalists and herb-doctors who obtain a scanty livelihood in obscure corners of our cities, and the gossops who still, in some of our villages, boast of their remedies for wounds and bruises, rheumatism and other bucolic ills" were dangerous or otherwise ineffective (1887:175). Established alternative treatments such as homeopathy, as well as the folk treatments performed by these wise women (for which the use of herbs like Rue was essential) were considered by Davenport Adams to be quackery. Elizabeth Blackwell's "A Curious Herbal" (1751): 1. The leaves are a Willow-green, and the Flowers yellow; the Stalks grow about two Foot high. 2. It is planted in Gardens, and flowers in Iune and Iuly. 3. The Leaves and Seed are used, benig esteem'd alexipharmic, good against all infections and pestilential Diseases, and all kind of Fevers; it eases Disorders of the Head, Nerves, Womb, convulsion and Histeric Fits, the Collick, Weakness of the Stomach and Bowels, it repells Poison, and lures the Bite of venemous [sic] Creatures and mad Dogs. It is an Ingredient in the Aqua Brion. comp. [Bryony water extracted with alcohol ] and the Aqua Theriacalis. The officinal preparations are the Simple Water, Conserve of the Leaves, and an oil by Decoction. William Thomas Fernie - "Herbal Simples" (1895): The wild Rue is found on the hills of Lancashire and Yorkshire, being more vehement in smell and in operation than the garden Rue. This latter, Buta gravcolens (powerfully redolent), the common cultivated Rue of our kitchen gardens, is a shrub with a pungent aromatic odour, and a bitter, hot, penetrating taste, having leaves of a bluish-green colour, and remaining verdant all the year round. It is first mentioned as cultivated in England by Turner, in his Herbal, 1562, and has since become one of the best known and most widely grown Simples for medicinal and homely uses. The leaves are so acrid, that if they be much handled they inflame the skin; and the wild plant possesses this acridity still more strongly. Water serves to extract the virtues of the cultivated shrub, better than spirit of wine is able to do. The juice of Rue is of great efficacy in some forms of epilepsy, operating for the most part insensibly, though sometimes causing vomiting or purging. If a leaf or two of Rue be chewed, a refreshing aromatic flavour will pervade the mouth, and nervous headache, giddiness, hysterical spasm, and palpitation, will be quickly relieved. Two drachms of powdered Rue, if taken every day regularly as a dose for a long while together, will often do wonders. It was much used by the ancients, and Hippocrates commended it. Mithridates also considered it able to resist poisons, and to expel them when taken ; but this notion became afterwards exploded. 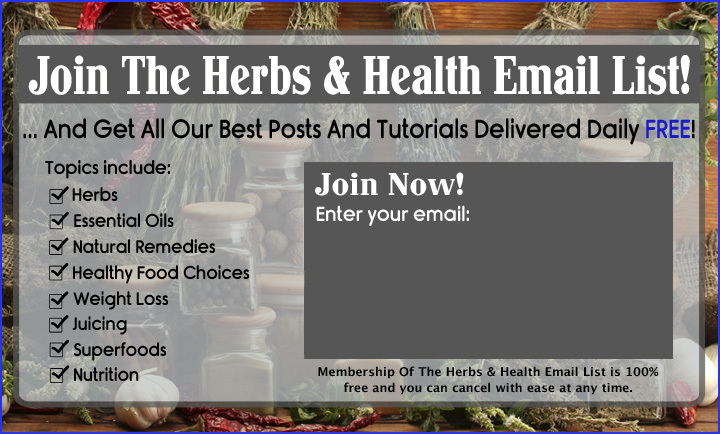 The herb is strongly stimulating and antispasmodic; its most important constituent being the volatile oil, which contains caprinic, pelargonic, caprylic, and œnantbylic acids. The oxygenated portion is caprinic aldehyde. In too full doses the oil causes aching of the loins, frequent urination, dulness and weight of mind, flushes of heat, unsteadiness of gait, and increased frequency of the pulse, but with diminished force. Similar symptoms are produced during an attack of the modern epidemical influenza, as likewise by oil of wormwood, and some other essential oils. Externally, Rue is an active irritant to the skin, causing a pustular eruption. It stimulates the monthly function in women, but must be used with caution. The decoction and infusion are to be made from the fresh plant, or (when this plant cannot be got) the oil may be given in a dose of from one to five drops. Externally, compresses saturated with a strong decoction of the plant, when applied to the chest, have been used beneficially for chronic bronchitis. Coctaque ruta facit de publicibus loca tuta." The leaves promote the menses, being given in doses of from fifteen to twenty grains. "Pliny," says John Evelyn, "reports Rue to be of such effect for the preservation of sight, that the painters of his time used to devour a great quantity of it; and the herb is still eaten by the Italians frequently mingled amongst their salads." With respect to its use in epilepsy, Julius Caesar Baricellus said: "I gave to my own children two scruples of the juice of Rue, and a small matter of gold; and, by the blessing of God, they were freed from their fits." The essential oil of Rue may be used for the same purpose, and in like manner. Formerly this plant was thought to bestow second sight; and so sacred a regard was at one time felt for it in these islands, that the missionaries sprinkled their holy water from brushes made of the Rue; for which cause it was named "Herb of Grace." Gerard tells us: "The garden Rue, which is better than the wild Rue for physic's use, grows most profitably (as Dioscorides said) under a fig tree." "The herb, a little boiled or scalded, and kept in pickle as is samphire, quickens the sight. But the wild Rue venometh the hands that touch it; and will also infect the face; therefore, it is not to be admitted to meat or for medicine." The leaves of Rue are curative of croup in poultry. In the early part of the present century it was customary for judges, sitting at assize, to have sprigs of Rue placed on the bench of the dock, as defensive against the pestilential infection brought into court from gaol by the prisoners. The herb was supposed to afford powerful protection from contagion. At the present time the medicinal tincture is used for the treatment of rheumatism, when developed in the membranes which invest the bones. Charles Alston - "Lectures on the materia medica: containing the natural history of drugs" (1770): Common or Garden-Rue; by some Herb-of-grace. It grows in Spain, etc. In gardens it flowers in June. The leaves, flowering tops, and fruit, or feeds with their feed-vessels, are used...It is antacid, acrid, detergent, diaphoretic and diuretic, powerfully dissolving as well as stimulating, called alexipharmic, cephalic, nervine and uterine; and is commended internally in malignant fevers, pestilence, poisons, bites of mad dogs, serpents, &c. in cachexies, scurvies, agues, palsies, epilepsies, palipitatio cordis, vapours, melancholy, worms, &c. and outwardly, for pains, inflammations, tumors, gangrenes, &c.
The fresh herb may be given, or its juice, with wine &c. or used like tea... well-rubbed with sugar and diluted. Elkhorst, Kimberley, Vincent DeLeo and Joan Csaposs. 2007. Rue the Herb: Ruta graveolens--Associated Phytophototoxicity In Dermatitis 18(11): Pp. 52-55. Fadlalla K, Watson A, Yehualaeshet T, Turner T, Samuel T. 2011. Ruta graveolens extract induces DNA damage pathways and blocks Akt activation to inhibit cancer cell proliferation and survival In Anticancer Research 31(1): Pp 233-41. Garland, Sarah. The Complete Book of Herbs and Spices. 1979. Francis Lincoln Limited:London. Rabaev E, Zeller L, Biton A, Barski L. 2011. Toxic Hepatitis Due to the Use of Ruta Herbal Medicine. In Harefuah [Article in Hebrew]. 150(3): Pp 235-6, 305. JAMA: The Journal of the American Medical Association. Vol. 24. 1895.